There are many tourist places in Bangalore which attract visitors to this beautiful city. Bangalore is renamed as Bengaluru and known as "Garden City" and "Silicon Valley of India". Bengaluru city houses many interesting places including historical and cultural importance. 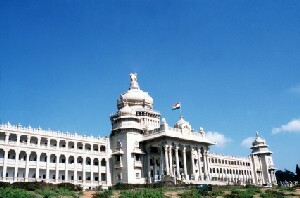 This majestic building,pride of Bangalore, is one of the important Bangalore attractions. It houses both the Secretariat and the State Legislature and many State Government offices. The gleaming white domes, pillars and archways resemble the architectural pattern of Mysore’s old palaces. When illuminated the entire building presents a breathtaking picture. National Gallery of Modern Art - Located at Palace Road, this Gallery is housed in a colonial mansion with a garden setting, and has two interconnected wings. The old wing features works from the early 18th century up until India's Independence, while the new one displays works from a large number of modern and contemporary artists. There's a cafe on the premise. More details here. Lalbagh Botanical Gardens– Housed in the heart of the city, set on 240-acres, these gardens contain the largest collection of rare tropical and sub-tropical plants and trees, rose gardens, lotus pools, fountains and a deer park. Another attraction of the garden is the Glasshouse constructed on the pattern of the Crystal Palace in London. Regular shows of flowers, fruits and vegetables are held here in January and August. Cubbon Park – This beautiful 300 acre park is studded with splendid sculptures and Gothic buildings, which house the Public Library, Government Museum, Technological and Industrial Museum and the High Court. A diamond shaped Aquarium, with a good collection of exotic fishes is also there. The Jawahar Bal Bhavan and the Children’s Park are exclusively for the children. Ulsoor Lake - A beautiful lake with tiny islands in the heart of the city. Boating facilities are available here. Nagavara Lake - Located in the Outer Ring Road, it is a lake with a difference and well maintained. Boating facility is also available. 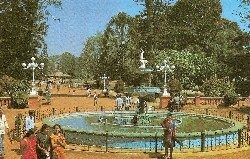 The lake has a water-front Park called Lumbini Gardens. Two Palaces are also included in the tourist places in Bangalore. Maharaja’s Bangalore Palace - Built in 1887 by the Wodeyars of Mysore, this magnificent palace is noted for its superb wood carvings. Tipu Sultan’s Palace – Built in 1791, today it houses a museum, exhibiting artefacts from the era of Haider Ali and Tipu Sultan. Near the palace is the Fort, which was their strong hold through several battles. The Bull Temple - It was built by Kempegowda in the 16th century AD, in Dravidian style of Architecture. The gray granite sacred bull, Nandi, is the main attraction after which the temple has been named. The sacred bull has been carved out of a single granite block and measures 4.57 m in height and 6.10 m in length.This is also one of the main attractions of Bangalore Karnataka India. ISKCON Temple – The Hare Krishna Temple is built on a hillock among scenic surroundings, with a perfect blend of modern technology and spiritual harmony. Infant Jesus Church – A famous church. St.Mary’s Cathedral – Originally built by a French missionary in 1882, it is a grand Gothic style Basilica. Jumma Masjid - The city’s oldest mosque , with ornamental granite pillars, was originally built by Mughal Killedar. Banashankari Temple at Kanakapura Road, a popular temple of Bangalore. Sri Someswara Temple at Ulsoor. Savandurga Hills - 40 kms away from Bangalore . It is a great picnic spot and one of the one-day trip destinations from Bengaluru . Hotels in Bangalore Karnataka India.